There are many ways you can support our cause. Whether you choose to donate time or money, we would love any assistance. Stopping violence requires more than just rallies and conversation. It requires hands-on grassroots efforts and funding. We challenge you to help us change the city we love for the better. 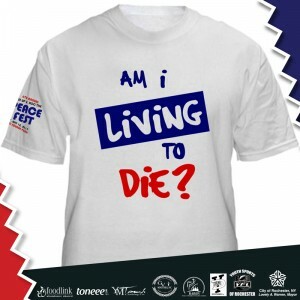 Our comfortable all cotton tees raise an alarming question that our at-risk youth should be asking themselves: “Am I Living To Die?” By wearing this t-shirt, you are demonstrating your commitment to help impede violence in Rochester. To order, choose a size below! Sponsored by YOUTH SPORTS OF ROCHESTER. T-shirt layout and production by YM Touch Clothing Company in Rochester, New York. Slogan and Event design sponsored by toneee.com. If you wish to provide products in lieu of money, please contact us directly. Another great way to help is to set up a booth at the actual festival. You may handout informational pamphlets or samples for your business and it is a great way to give back to the community. The very thread and foundation of our efforts require a very integral factor: YOU! Please complete a volunteer application whether you can help prior to and/or during the Event. Roc The Peace wants you to ROCK THE MIC! If you are a talented singer, poet, musician, rapper, comedian, etc, please feel free to complete a talent application and come out to our closed audition! Making a real dent in our fight against violence requires us to raise money. Every bit helps, whether $10 or 10,000. Please use the form below to donate to us electronically or reach out to us directly for donations in-person.